It seems like now that fall is here one of the boys is always sick. This weekend Baby Sid had a stomach virus and the cold that everyone else has had. He was not a happy camper this weekend. Because of him not feeling well, he didn’t get to go to the pumpkin patch with Ian’s school. 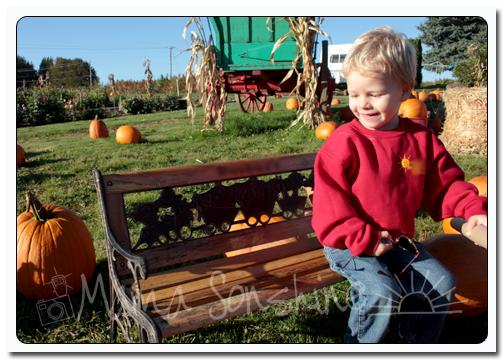 I really wanted to take some pictures of Sid with the pumpkins, so I guess we will have to make a third trip! My mom ended up doing dinner on Sunday for my Grandma & Sister’s birthdays so I carried over my plans for dinner to Monday. I was happy to have dinner in the crockpot when I got home from work, since I was exhausted. Categories: Cooking, Food, Homemaking, Meal Plan Monday, Parenting, Recipes | Tags: Cook, cooking, Dinner, Kitchen, Meal Plan, Meal Plan Monday, Meal Planning, Menu Plan, Menu Plan Monday, Menu Planning, Motherhood, Org Junkie, Organizing Junkie, Plan to Eat, postaweek, Pumpkin Patch, Recipe, recipes, Slow cooker, what to cook | Permalink.